From 28 to 31 October an eight people strong delegation from the Beihang University of Aeronautics and Astronautics (BUAA) in Beijing (China) visited the Robert Owen Centre for Educational Change and the School of Education. The delegation consisted of the Director and six academic staff of BUAA’s Institute for Higher Education and of the Dean of the School of Humanities and Social Sciences. 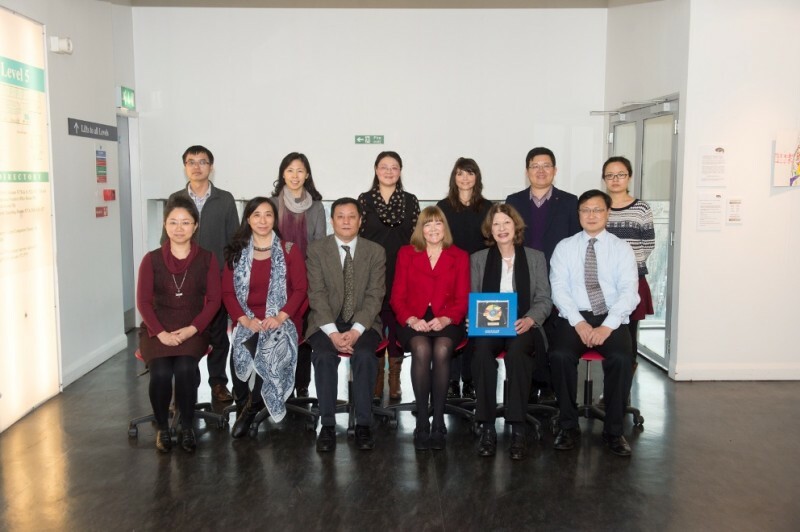 On the first day they were greeted by Prof. Kay Livingston, Deputy Head of School, and by Prof. Michele Schweisfurth, Co-Director of ROC who gave our Chinese guests an overview of the thematic strands and related research carried out by ROC. Further sessions during that day were dedicated to discussing professional degree programmes (with Prof. Penny Enslin, Prof. Nicki Hedge, Prof. Beth Dickson) and issues of professionalization in higher education institutions. These topics served to deepen an already existing research cooperation which will continue over the next couple of years. A further topic for discussion was the potential for establishing a collaborative PhD programme between the Beihang Institute for Higher Education and ROC / the School of Education (UoG representatives: Angela Melley, Lexy Docwra, Dr. Oscar Odena, Dr. Gijsbert Stoet). As there are considerable overlaps in research topics between the Institute and ROC an exchange of doctoral students was seen as quite feasible. Further details of this potential cooperation will be developed in the coming year. The second day of the visit had a focus on CRADALL and the UBDC/PASCAL Learning City network. Dr. Margaret Sutherland provided an overview of CRADALL. The Learning City network was introduced by Dr. Muir Houston and Dr. Catherine Lido. Lunchtime meetings took place with Prof. Chris Chapman, Director of ROC and Dr. Alan Britton, School International Lead. The afternoon of the second day the delegation had the opportunity to visit the College of Science and Engineering of the University of Glasgow. On the evening of the second day a dinner at The Bothy was organised by RIO during which the offer to try on kilts was met with enthusiasm and led to a great deal of laughter. The last couple of days the delegation spent sightseeing in Glasgow and Edinburgh before setting off for Spain on early Sunday morning.